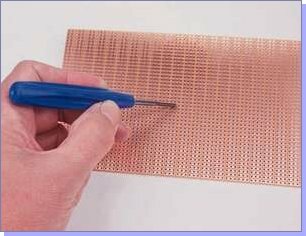 Stripboard is similar in design to breadboard, in that it has a regular matrix of holes for component leads, arranged into parallel copper tracks. The difference is that the components must be soldered to the tracks, meaning that you can use stripboard to produce your final circuits. Unlike breadboard, stripboard can be cut and drilled to meet the size requirements of your model. Always design your stripboard layout on paper before you attempt any soldering! A grid such as the Stripboard Layout Planning Sheet which you can download below should make designing stripboard layouts easier. Please note that the PDF version of this sheet can take a long time to print. Generally, it is best to start by designating two tracks to carry the power supply for the circuit, in the same way as you would for breadboard prototypes. Next, position the ICs, marking crosses (X) where the tracks should be broken, and connect up each pin in turn to the rest of the components in the circuit. Don't be too fussy about the exact positioning at this stage. Use tinned copper wire links, or surplus leads from components, to make connections from track to track. On your second draft of the design, try to minimise these links and place components closer together, saving board space. The underside of a piece of stripboard has rows of copper tracks like those on Printed Circuit Boards (PCBs). The tracks have holes spaced at 0.1" intervals so that components may be pushed through the board and soldered. Integrated Circuits (ICs) are placed at a right-angle to the direction of the tracks so that each pins has a section of track to itself. Normally, you will need to cut the tracks between the IC pins so that they are not connected. This is done using a special tool called a Spot Face Cutter. Do not apply great force when using this tool - let it do the work so that you end up with a clean, round cut. Check that there are no small pieces of copper left over joining or shorting the tracks. Don't solder ICs directly onto the stripboard as you may need to remove them later. The heat from your soldering iron would also be likely to damage the IC, so always solder in an IC holder and do not insert the IC into it until all soldering on the board is complete. Finally, when you have built the circuit, remember not to mount it where any Meccano parts can touch the tracks! Many sizes of stripboard are available. The size given below is one of the smaller sizes. Post your questions and comments about this article to the Practical Matters Message Board.